The world we now live in, relies on us storing and providing information online. With more information out there about us, it can put our identity at risk. 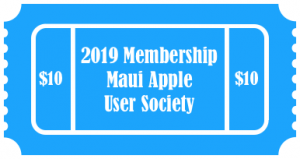 Join us this month as our topic will focus on ways to manage your Mac and iOS security, privacy, and online safety. We will discuss built in security measures, added software tools, and general online safety tips. As always, we will save time for your Mac and iOS questions. For directions to our meetings, click here.